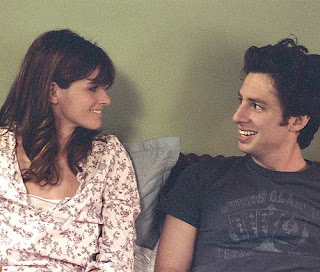 After he is fired from his job during a food fight in a New York City kitchen and his beautiful brainy wife leaves her breadwinning career as an attorney to become a full time mother to their new baby Oliver, Tom (Zach Braff) and Sofia (Amanda Peet) return to the Ohio community where she grew up. Greeted with a gaudy furniture set from her eager parents Amelia and Bob (Mia Farrow and Charles Grodin in his first film in over a decade), Tom is given a job at Bob’s advertising agency Sunburst. As if working for his father-in-law isn’t bad enough, Tom quickly learns that the mentor to whom he’s been assigned is his wife’s ex boyfriend from her high school cheerleading days, Chip Sanders (Jason Bateman), who still seems to carry a torch for the girl that got away. To complicate matters, on his first day at the strange surroundings where employees who make errors have to write down their apologies on a yellow pad (in an idea taken from the Japanese) and Tom learns how to throw an imaginary “Yes” ball to coworkers to make sure they’re all in synch (which all corporate cubicle slaves will chuckle at), he is told he will be the “Macchio” to Chip’s Miyagi in their Karate Kid styled training. It’s only after he mistakenly hurls the “Yes” ball to Chip too far (which in itself is ironic as it’s invisible) that Tom realizes that Chip is paralyzed from the waist down and wheelchair bound. Skating on Farrelly brothers territory in daring to use a disability in a comedic way, (and as a reviewer I do take strong objection to using disability for cheap laughs), however the film turns out not to be all that offensive as Bateman becomes increasingly creepy and sneaky in his dealings with Tom that culminate in some hilarious, shocking confrontations complete with an earned twist at the end provided by first time screenwriting team David Guion and Michael Handelman that helps make all that came before it a little easier to sit with. In addition, throughout the film, it’s repeatedly stated that Chip’s personality is what is insane rather than the chair itself as he tries to drive a wedge between Tom and Sofia and rekindle the flame. As a romantic triangle piece there are a few funny moments indeed but The Ex is at its best when ridiculing life at work that should hit home with most viewers in regards to some of the condescending team building and game playing that occurs in corporate America. In fact, afterwards, when I learned from IMDB that the film was initially called Fast Track, I felt that if they’d completely stuck with the Office Space styled idea, it would’ve been a little less uneven in places. This being said, it’s still a very funny and amusingly clever little film with excellent performances by the entire cast (especially Bateman who uses his Arrested Development skills to great effect here) and well worth the rental.